If you want to convey crucial information to decision makers in the easiest and most effective way possible, you need to be using interactive dashboards. Business dashboards, like the one above, offer at-a-glance insights based on Key-Performance-Indicators (KPIs) and are an intuitive and visually pleasing way to consume data. Unlike early predecessors, they give presenters the ability to engage audiences with real-time data. They also offer a more dynamic approach to presenting data compared to the rigid, linear nature of Powerpoint or the numbers-without-a-story approach of Excel. At datapine we believe the goal of each dashboard you create should be better, faster, and stronger decision making while telling a story. In other words: how to tell the best possible story and how to create a dashboard to support that story? We’re going to help you answer that question in this post. First, we’ll cover how you should keep your audience in mind during the creation process. Next, we’ll show you a few great examples that you can model your own ones after. Then, we’ll go into some dashboard design, and finally we’ll conclude with some “do’s” and “don’ts”. Exclusive Bonus Content: Get our free guide for dashboard creation! 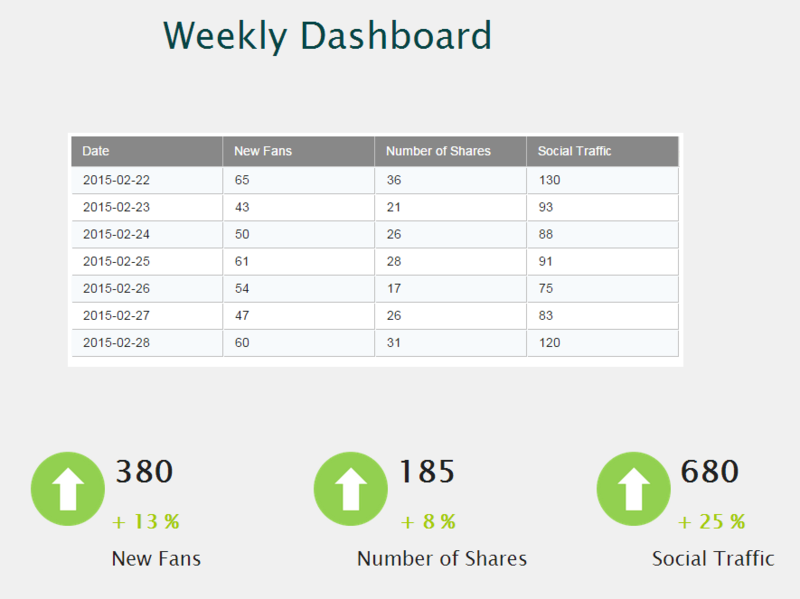 Check out the 10 steps to creating a stunningly effective dashboard. When we tell a story, we consider the audience and adapt our story accordingly. The same applies in our case, which means that the first step is to consider the needs of your users. For instance, an overview dashboard for your stakeholders who want a monthly report is bound to look different from an in-depth sales performance dashboard that your sales team needs to access on the fly. Let’s dive deeper. Sit down and take some time to complete answers to the following 5 questions. Trust us – any energy that you invest up-front in your creation process will be richly rewarded later on. Whoever will use it will greatly appreciate the time and effort you put in to make it relevant to their lives and focused on the essentials. Even if you’re just creating this dashboard for your own use, answering the following questions will give you the foundation you need to make it truly valuable. 1) Who are you trying to help? Remember that the ultimate, meta goal is to make your life or the life of someone in your organization easier. With that in mind, it’s wise to base all of your decisions on your audience so that you can truly know how to create a dashboard that is useful for them. So – who is the person, or group of people that will be actively using is? If it’s yourself (and only you), then you can skip the rest of this step. However, if more people than just yourself are going to use it, write down their roles in the company now. Ideally, write down a specific person that you personally know so that you can picture them in your mind as you go through the rest of this process. Don’t go any further in the creation process until you have written down the person (either in name, job title, or both) who you will be helping with your dashboard. 2) What do they do on a daily basis? Another way to think of this question is: what are the daily tasks that this person performs that are essential to their job? This is a more concrete way of defining someone’s role within your organization. 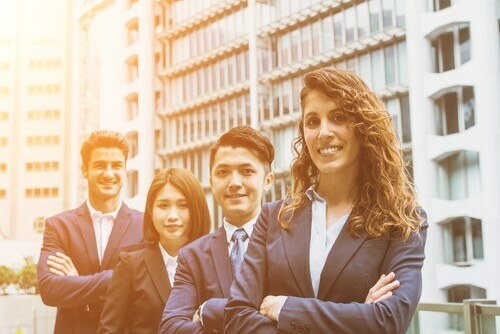 You want to be super specific here – the daily life of a sales agent who has to get all of their own leads is quite different from the daily work of a sales agent who has all of their leads supplied to them. And the daily life of the sales manager who is in charge of all the sales agents is more different still. These differences in daily tasks will result in different goals and KPIs. Don’t go any further in the creation process until you have written down at least 2-3 (if not more) of the daily tasks that the users absolutely must do in order to fulfill their role. 3) What goals are they trying to reach? Do they care about making more sales and getting new leads? Do they care about helping their staff get more sales and leads? Are they hoping to manage customer support calls more effectively? Do they want to get more social reach on the blog posts your company is putting out? Don’t go any further in the creation process until you have defined 1-3 goals that your user really cares about. Obviously, you can’t peer into their head – just make your best guess. Or, if you want to upgrade your approach a bit, reach out to the person whom you are creating the dashboard for and ask them what their goals are. 4) What KPIs, if measured, will help them reach their goals? Now that you know your user’s role, their daily essential tasks, and their goals, we can look at some KPIs that will help them. This step can be much easier if you simply ask your user, or if you have intimate knowledge of their job. If you don’t, you run the risk of creating a dashboard that nobody actually uses, wasting your time. If you don’t have the ability (or desire) to ask your end user what KPIs are valuable to them, our KPI examples and templates will give you a pretty good idea of what metrics you can use. 5) How are they currently viewing these KPIs? Now, the final question: how is your user viewing his KPIs right now, and what are the pain points associated with that way of seeing them? Maybe they are using an Excel doc, and it’s getting way too big and unwieldy. Maybe they are using their CRM software but it’s not really designed for that purpose. Whatever the case, you want to know this – because if you don’t know how to make a dashboard that is better than their existing KPI measurement method, you’ll have wasted your time. 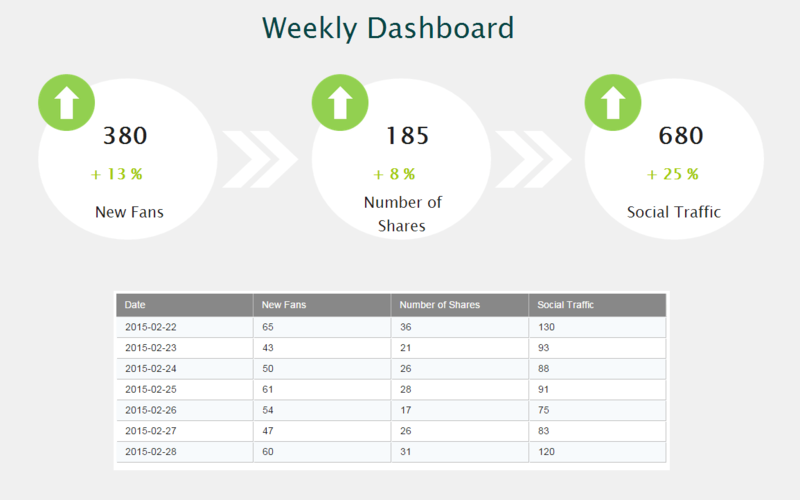 Ideally, you create a dashboard which is easier to use and more focused (less cluttered) than their current approach. In the rest of this post, you’ll learn how to do just that. With better access to data, and better tools to mine it, we’re able to recover A LOT of types of data. However, even though we love data, we can’t (and shouldn’t) display all of these types. The goal should be to avoid drowning the user in a data tsunami, while providing the best information available to aid in getting the actionable insights they need. If you have the capability, consider building an interactive dashboard. Empowering your audience to explore the data for themselves, through filtering or other controls, can add value by providing deeper context. Interactive visualizations are especially relevant when you have a broad target audience. Newcomers to the topic can still spot trends and learn the basics, while experts in the field can drill down deeper into the data for more insight. Let’s look at two examples datapine has created in order to provide some more context and show you how essential it is to customize it to fit your audience and needs. When looking at this logistics analytics dashboard, two KPIs immediately stand out: average loading time and average loading weight. While there is plenty of other information, it avoids too much clutter by using large images and by not cramming a bunch of stats on the page. Revenue, cost, and profit numbers are easily seen due to their upper left corner positioning and their large size, along with green and red numbers to show trends. 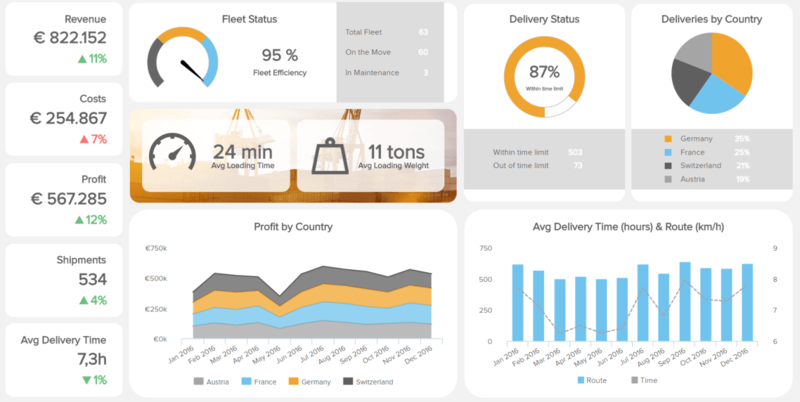 The fleet status and delivery status metrics are very easily seen as well. Finally, there is more detailed information available in the “profit by country”, “deliveries by country”, and “average delivery time (hours and route)”. This is a great example of a well-executed one, but our next one is even better. In terms of white space, clean layout, and providing useful data without overwhelming the user, this is one you want to learn from. Bar Charts – Perhaps the most common misconception about charts is that more is better. Bar Charts are a simple and effective way to look at cohort analyses, comparisons, and trends. Pie Charts – These charts are often the subject of controversy. Data visualization guru Edward Tufte writes, “pie charts are bad and that the only thing worse than one pie chart is lots of them.” No matter how you feel about pie charts, the only time you should use them is when you need a graph representing proportions of a whole, when the total of your numbers is 100%. Use sparingly. Gauges – This type of graphic typically displays one or more values using indicators and appropriate metrics. They are often used to highlight a specific KPI that needs attention. For a more detailed look at chart types and to understand which are the most appropriate for what you are trying to convey, you can check out this awesome chart suggestion guide. 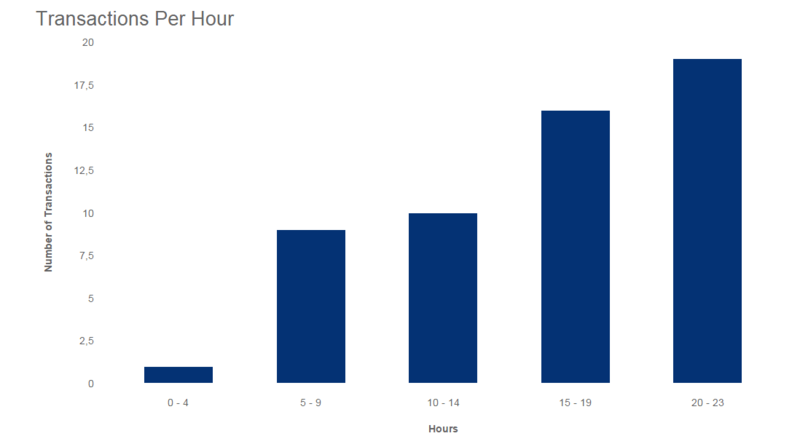 If we want to look at chart types in action, let’s go over how to make a dashboard that includes a chart that looks at number of transactions per hour. When using a bar chart, the data is presented in comparable groups which makes more sense to the human eye, and the use of only one color doesn’t distract from the data. 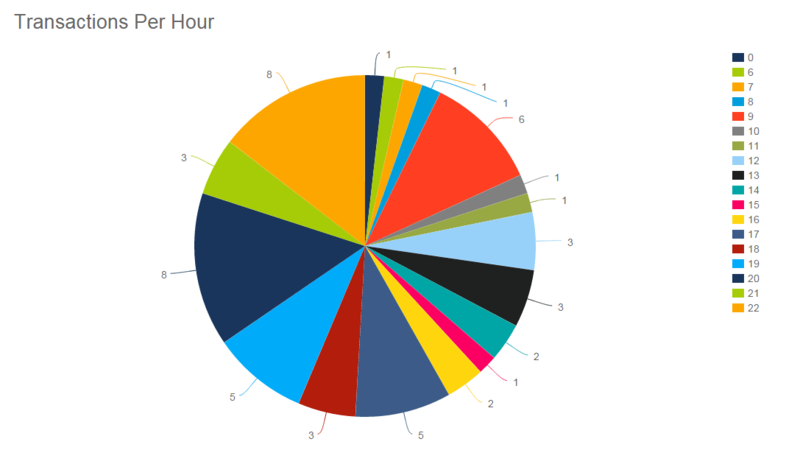 Now let’s take a look at the same transactions per hour through the lens of a pie chart. With this chart we are unable to glean any useful insights. Not only are there too many values in the dimension, but these numbers do not make up parts of a whole. We could write books on color theory, but luckily, that has already been done. For a great resource for which colors work together best, and which emotions they convey, check out this comprehensive guide on color for designers. One thing to take into consideration when selecting your colors is that roughly 8% of men and 0.5% of women are colorblind. The vast majority of people who fall into this category are what is called color impaired. This means that they can perceive a color, but cannot distinguish different shades of that color. Colorblind readers can perceive changes in brightness, for the most part, just like you can. For example, you can switch from a dark brown to a bright green, just not from a dark brown to a dark green. Above is an example how to make a dashboard with solid color choices. The colors complement each other and the bar graph features colors that aren’t confusing to those who are color impaired. Avoid overlapping shades of colors that have similar brightness value. For an example of what not to do, take a look at the example below: the reds and pinks totally clash, making it not only ugly, but unusable for color blind readers. 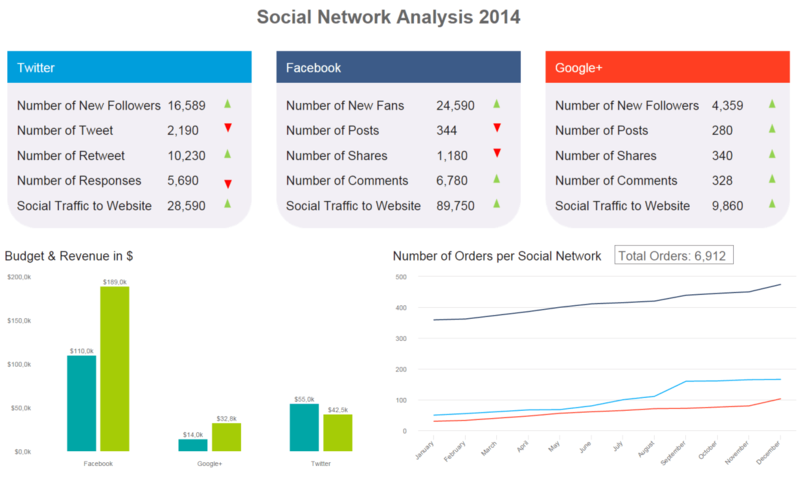 When understanding how to make a dashboard, it is critical to strategically place the charts. The goal is to arrange the data in a manner that fits the way it’s used. The most important data including the takeaways and main KPIs should be prominently displayed at the top. Data that needs to be compared must be arranged with that comparison in mind. A good example is where the KPIs are prominently displayed at the top of the page, followed by the supporting data. Your eye automatically travels to the most important information. Below you see a really basic dashboard just to demonstrate it. Now, let’s look at a bad example. This one starts with a table of data, and the most important numbers are hidden at the very bottom. The KPIs aren’t presented in a way that shows a logical flow. This information on design is just scratching the surface however. If you want to dive deeper, be sure to check out our post on dashboard design principles. We have gone through a LOT of information in this post. Let’s summarize the advice given so far with some general rules of thumb to do and avoid. DO build dashboards that focus on the needs of your audience. DO keep your dashboards as simple, clean, and minimalist as you can while also including all of the most important KPIs necessary. DO make sure that your final dashboard is better than your audience’s previous method of viewing their KPIs. DO tell a story, as stories are easily understood by the human mind. DON’T clutter your dashboard with too much data. This is the number one rule to follow! Too much data = too hard to use = waste of time. DON’T use colors that are very similar in brightness as your main colors – color blind people won’t be able to use your dashboard. DON’T make a “one size fits all” dashboard. Make it with specific people and needs in mind. DON’T use pie charts except in cases where you are showing parts of a whole. These are just some general rules of thumb – for more information on the best practices you should use, make sure to check out our post on business intelligence dashboard best practices. Once you’ve understood your target audience, the purpose of your work, and have selected the charts and design, there is one final step: have fun and be creative. Here’s a fun example we made for this year’s Super Bowl that took place in February. For greater clarity, you can click on the dashboard below or here to view the entire analysis and statistics of the teams. 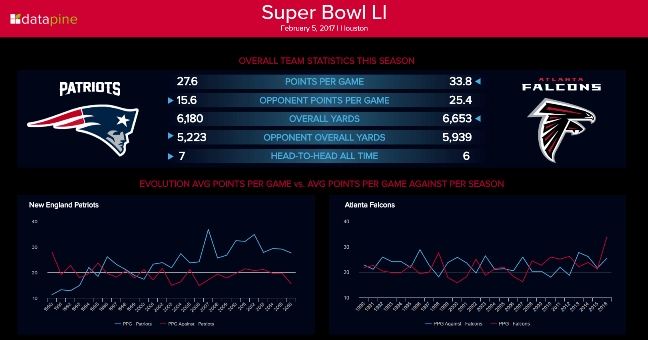 We made it accordingly to the NFL (National Football League) colors and coincidently it also fit the Patriots’ and the Flacons’ graphic chart, which is even better. The center table compares an overall stats for both teams, while the line charts underneath are used to show the two different trends respectively for each team, pointing out the evolution of their annual performance over the past two decades. 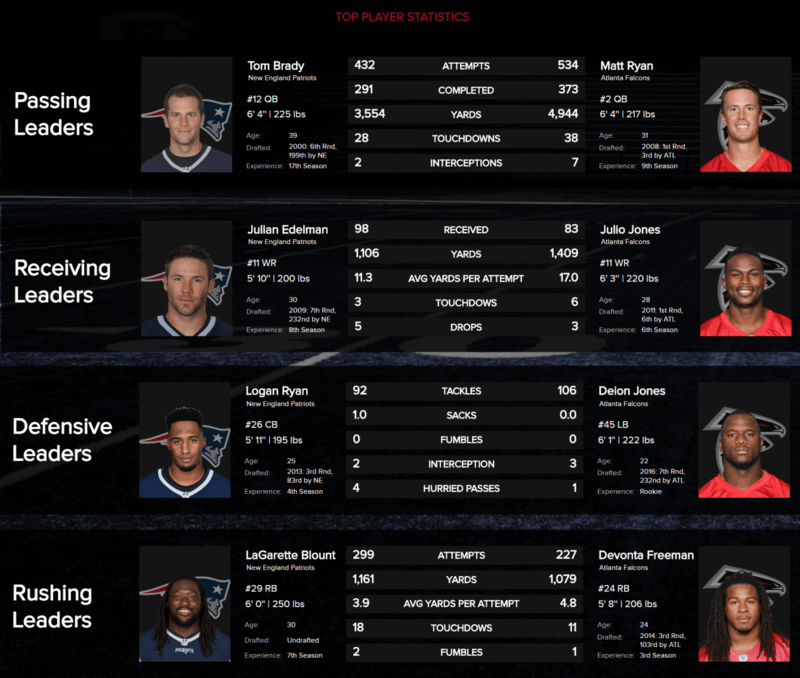 The players’ statistics aim to compare each team’s best player in his position (passing, receiving, defensive or rushing). Matching a photo with a name is always much more attractive for the human brain since half of it is dedicated to the visual function, and that 90% of the information transferred to the brain is actually visual. It not only gives a personal touch to your dashboard but it also adds clarity when you have a lot of numbers and figures to display, as it is the case here. Through stunning visuals, advanced chart options and real-time data, modern dashboard software like datapine has revolutionized the ways that you can report data. Interactive dashboards combine power and flexibility to bring your key metrics together so you can run a better, more data-driven business. Don’t miss your chance and try datapine 14 days for free.